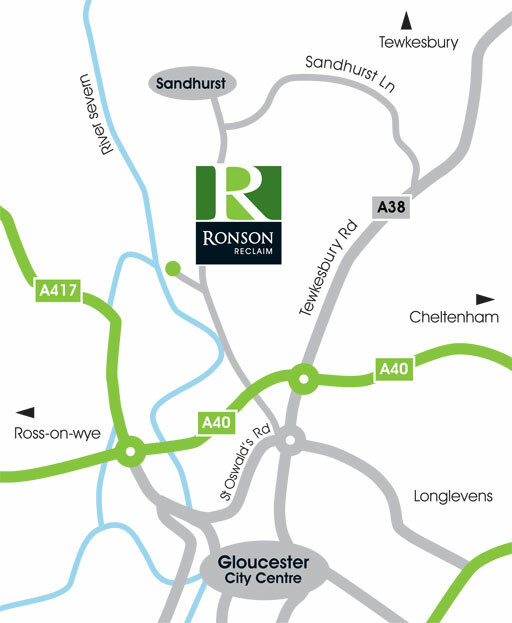 Ronson Reclaim is situated on Sandhurst Lane on the outskirts of Gloucester, 6 miles from Junction 11 of the M5. From the motorway, turn right at the first roundabout (signed Gloucester / Ross on Wye) and left at the next roundabout (signed A38 Gloucester / historic docks). Turn right at the next roundabout (signed historic docks) into St Oswalds Road. Because this is a dual carriageway, you have to go to the next roundabout and turn back on yourself in the direction you’ve just come from. Then turn left into Sandhurst Lane (also signed White Horse Chinese restaurant) Ronson Reclaim is one mile up on your left.